Our first interview of 2019 took us to New Zealand, where we caught up with international player, Matt Ansley. Matt took the time to talk to our reporter, Steve Lovell, about growing the sport back home, learning about the equipment and how he found his trip to the WMF conference in Munich, Germany. Steve Lovell (SL): Hi Matt, introduce yourself to everyone. Matt Ansley (MA): Hi everyone. I'm Matt Ansley, I'm 34 years old, 35 next month in March. I live in Auckland, New Zealand, and been here since 2005. My hometown is Whanganui in the lower part of the North Island. I work for �Believe It Or Not Quiz Events�, we make, produce and send out pub quiz nights (trivia nights in other parts of the world) to venues all across New Zealand. I've been there since 2008. I host a quiz at three venues each week, Monday, Tuesday and Wednesday. I work four days in the office (Monday to Thursday) plus the evening hosting (Monday to Wednesday) and then three-day weekends every week. SL: So when did you first start playing minigolf? Are you a convert from golf itself? MA: My earliest memory of minigolf was when I was six or seven years old. It was my Mum's work social evening and family were invited. I scored 14 on one hole and ran to my Dad to tell him. He told me not to say it too loud!! I finished with 99 and I thought I had won, not realising it was the lowest score needed. I also managed an ace (hole-in-one) so received a prize for the ace and last place. I played �big� golf from the age of 13 until 20 with one year off in 2002 when I lived in the UK after high school. I have averaged one game every 18 months or so since then. My Dad, three Uncles, and their Dad (my grandfather) all played too so it was a very family affair. Always competitive too. SL: Where did you live in the UK? MA: I lived in Salisbury, Wiltshire, in 2002. I was a teacher assistant at Salisbury Cathedral School. My main roles were with the PE Department and the boarding house. 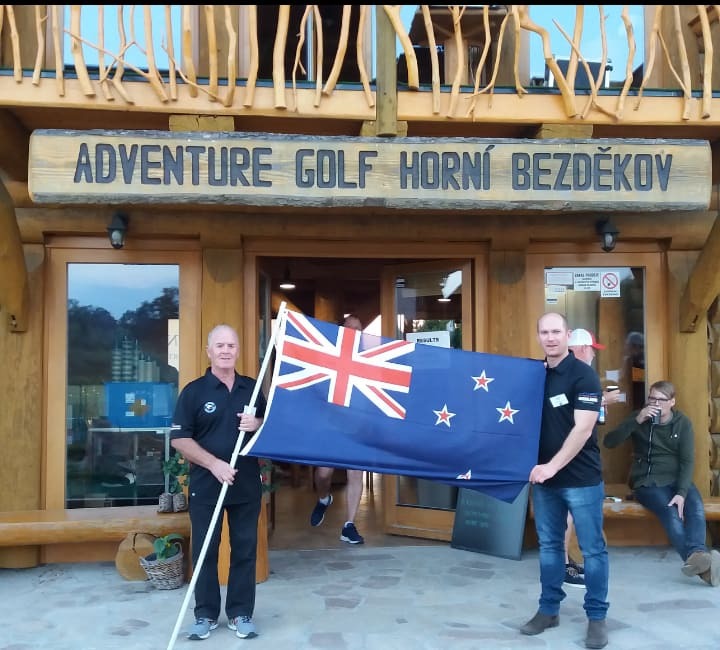 SL: Competitive minigolf is a relatively recent addition to New Zealand, with the Kiwi's first foray into international events in 2015. What issues do you face as a country to construct a tour and to encourage people to represent New Zealand overseas? MA: Our first tour (or series) of events started in April 2017. It ran for ten events and finished in March 2018. We managed to squeeze the next season into the remainder of 2018 and the third season starts on February 16 with 11 events planned for this year. One issue we have is finding courses prepared to host an event. Courses in New Zealand are businesses, not clubs. A Minigolf Club is not something anyone has thought of until recent years. Developing relationships with owners is key to keeping events going year after year. Some owners ask us to play outside of peak hours which is understandable. So far, the events have been based in the Auckland, Waikato and Bay of Plenty areas so not all of New Zealand. We had one event last year in Taranaki. Another issue we face in New Zealand in terms of international events is we are so far away from most of the world. It's over 24 hours to travel to most parts of Europe plus the time difference of anywhere between 11-13 hours and of course, the financial cost and time off work. We also don't have any miniature golf or felt courses. Most courses are versions of Adventure Golf (MOS). Most New Zealand players play each local event with a golf ball and that's all. SL: You made your international debut at the WAGM in Horni Bezdekov last year. How did you find the experience and what's it like having your dad, John, as a teammate? MA: I had no idea of many, many things. Dad and I turned up with a few Chromax balls and metal putters. That's all we had used in the New Zealand events and it had served us well. The amount of different balls was a big learning experience. We had no idea what ball to use for what hole, thankfully we had a few donated to us and had three days to learn how to use them. One of our fellow New Zealand players back in NZ had ordered two rubber-faced putters to be brought back to NZ with us. We didn't know about this until we got there so we ended up using those two putters for WAGM. So brand new balls and putters and three days to learn before a big event like WAGM on a very tough course like Horni Bezdekov was not ideal preparation. The intensity on game days was more than I was expecting too. The pace of play was very very slow and it got to me during round four. I prefer faster play and the pace of play is a factor in whether I play future events like the WAGM. The opening and closing ceremonies were well beyond my expectations in a good way. I took a quick film of the opening ceremony and family and friends back in New Zealand were impressed with the preparation put in. Playing with Dad is great. We know how each other play, we encourage when we play good shots and when we play bad shots, we know we don't need to say anything. Dad won the first NZ Tour and I finished second and then in the second tour, I won and Dad finished second. SL: What interests do you have away from minigolf? I understand you're into running. MA: I've played a variety of sports over the years. Cricket, football, volleyball, big golf during high school. I played rugby for eight years from 2008 to 2015 in Auckland. I also started obstacle racing in 2013. OCR for short, events are run by companies like Tough Mudder and Spartan. I love them, they're the complete opposite to minigolf. My highlights have been competing in the World's Toughest Mudder in Las Vegas four years in a row from 2014 to 2017. It's a 24 hour obstacle race, once again completely opposite to minigolf. I enjoy running, I've completed close to 30 half marathons and 17 full marathons. So, it's been a busy and active life so far. SL: What's your take on the balance between people that enjoy the sport as a social activity and those who like the competitive element? Tell us a little about the Auckland Minigolf Club. MA: Minigolf in New Zealand is still in its early days. Growing numbers is a big goal, if not the number one goal. Everyone is time-poor these days so if you want people to participate in what you're offering, you have to make it attractive, fun and worthwhile. Most players are competitive but don't take themselves too seriously. Because we play events with public all the time, some ask questions, others laugh, others say they will come to the next one but never do, but we have to be mindful to grow numbers, we need an attractive product. So avoiding bad behaviour on the course is ideal. We started the Auckland Minigolf Club this year and it had been talked about for most of 2018. Nobody really knew what to do or what a minigolf club does, so I thought why not start one and learn as we go. We've had two club nights so far with 14 and 13 players respectively. The idea is to play a few more nights and develop handicaps for each player so we can then start some types of competition based on handicaps. The first two nights have been a lot of fun in a supportive environment. We try and have two rounds of individual play and then have a best-ball round which gets the celebrations started with numerous aces. It's very early days and one big goal will be to attract new players. We currently meet every second Sunday evening but will meet earlier on a Sunday once summer has finished. We have a good relationship with the Thornleigh Minigolf Club in Sydney, Australia, and we'll ask them for advice on handicap systems and other info. SL: How did you get involved as the WMF representative for Oceania? MA: I was acting on behalf of Damian Kissick who has been on the Technical Committee for the previous year. He couldn't make the trip to Germany so asked if I would be interested. As a single guy with no responsibility, it was easy to get time off to go. I am happy to help the sport of Minigolf in Oceania grow. SL: You attended the recent delegates conference in Munich. How did you feel it went, is it what you expected and as the representative for Oceania, what issues and difficulties do you feel face minigolfers from your continent? MA: The conference was fascinating. I learned so much. From history of minigolf to dimensions of lanes and the distance an obstacle must be from the hole and so on. Nothing like that in New Zealand. At times, it was hard to transfer what was being discussed to our environment in New Zealand and Australia. We don't have the playing numbers like in Europe. Oceania players face the problems of distance to travel, lack of championship level courses and having friends make fun of you for playing minigolf competitively. SL: Do you feel one day that New Zealand or Australia could be ready to host an international event, like the WAGM? MA: Yes, we could host one for sure. Whether enough players travel the distance to compete is the big question. SL: What are your hopes for minigolf for the future? MA: That we grow the numbers playing in New Zealand and find sponsors to sponsor any national teams competing overseas. Personally, I have no set goals other than to help grow the game. I'm learning as I'm going and hoping to lean on the experience from those who have been doing this for many, many years. SL: What is the best thing you like about minigolf? MA: That anybody can play. Most sports suit a certain body shape, like height for basketball and volleyball, or massive endurance for marathon runners. Minigolf can be played by most people. Seeing people enjoy playing and meeting other people through minigolf is a bonus. Friendships have developed in New Zealand between players who never would have met if not for minigolf. Minigolfnews would like to thank Matt Ansley for his time. The photo shows Matt (right) and his father John at the WAGM 2018 in Horni Bezdekov, Czech Republic.